Easy to use, easy to pack in a glove compartment or a first aid kit. The tick removal process was painless, and the tick itself wasn't compressed during the removal, which reduces the chance releasing disease organisms back into the host. The Tick Twister tool is available at local pet supply retailers and online. Low cost, safe, and easy-to-use tool. Utilizes a technique that reduces the injection of infectious agents from the tick into the host. Large tool has a hole on the handle to attach to a leash or key ring. Small tools are small. No way to attach them to a key ring or another keeper. If a too-large tool was used, more of the tick body could slip through, but probably OK.
Easy to see bright green plastic tool for safely removing ticks. Photos of all tool sizes can be seen here. Tick Twister can be used on dogs, cats, horses, humans and any animals with ticks attached. 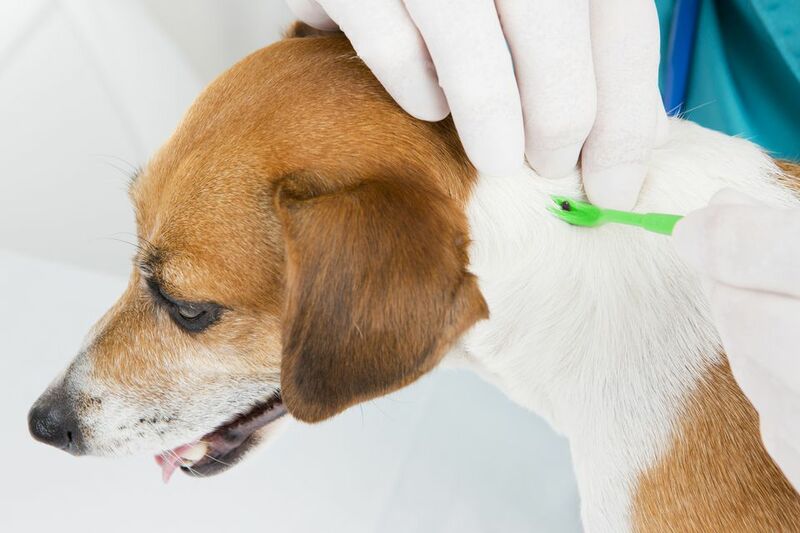 Ticks spread diseases to animals and humans through bites. They remain attached to the skin, ingesting blood for several hours before falling off. Early removal is key to lowering chances of contracting diseases such as Lyme Disease, Ehrlichiosis, and Babesiosis. Daily tick checks are important. In the case of Lyme Disease, the American Lyme Disease Foundation states that ​ticks must be attached for 36 hours or more to spread disease. Large (engorged) ticks must be handled with extra care, since they have been attached for many hours. The tick attaches to skin by the mouthparts. Those mouthparts are barbed - they do not pull out easily. Removing a tick by pinching, lighting a match, or applying petroleum jelly to the body is not the best technique - it may actually introduce more pathogens into the host that the tick is attached to. Wear gloves to prevent any accidental contamination and wash hands. Learn more about how to safely remove ticks. The Tick Twister tool is available in 3 sizes, the size to use depends on how big the tick is; the tick species and degree of engorgement. The tool is slipped between the skin and the tick, from the side of the tick body. Gentle traction away from the skin surface will remove the tick at the very base of the mouthparts, assuming the proper size tool is used. I used this tool on a tick that had recently become embedded in a dog's ear. The tick was not visibly engorged, but was firmly embedded. I used the smallest tool. I did not need to twist as the tool instructions say, but removed the tick with gentle upward traction. The dog did not seem to notice. Here is a video from Tick Twister, demonstrating this tool on dogs, cats, horses, and humans, with a variety of sizes of ticks.